Microsoft Dynamics CRM is a full Customer Relationship Management (CRM) suite with Marketing, Sales, and Service capabilities that are Fast, Familiar, and Fexible, helping businesses of all sizes to find, win, and grow profitable customer relationships. 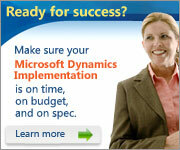 Microsoft Dynamics CRM works with familiar Microsoft® products to streamline processes across an entire business. Get started quickly in a familiar Microsoft Office Outlook® environment designed to support fast user adoption and high utilization of your CRM solution. Empower users to work with familiar tools, such as Microsoft Office Word and Microsoft Office Excel® spreadsheet software, to create their own dashboards and personal workflows with wizard-based tools without reliance on outside support. Provide role-tailored access to information and data both online and offline, giving people access to only the information they want and need—delivered in the way they want it. Design and automate business processes to unify line-of-business systems with flexible, easy-to-use tools built on the Microsoft Windows® Workflow Foundation platform. Conduct business globally with full support for multiple languages and currencies across multiple time zones so you can compete globally while keeping costs under control. Align IT and business goals with point-and-click customizations, extensible data models, and mapping tools to help build a solution that matches your business and your people.